We have received numerous inquiries from friends and students of our beloved Senior Dharma Teacher Zenkei Blanche Hartman about how she’s doing, especially from those who live outside the Bay Area. We created this blog to ensure that those who care so deeply for Blanche are kept informed and updated as changes occur in her health and situation. I’d like to share with you parts of a recent conversation Blanche had with Danielle Macias, who manages our human resources and retirement program, so that you can hear from Blanche herself. They talked last month at Age Song, the assisted living facility where Blanche currently lives. Blanche said she wanted you all to know about her current condition and how she is faring with the changes in her life and body. – I have received, and someone reads to me, the cards that people have sent. I can’t respond to all of them, but I miss being with you a lot, and I love you. Don’t forget that even if you don’t hear personally from me that I love you. – I try to keep physically active, exercising my body in whatever way I can find to do in my bed, but my age has caught up with me. It hasn’t yet overtaken me—but we should be prepared for that. I think that’s enough (for now). 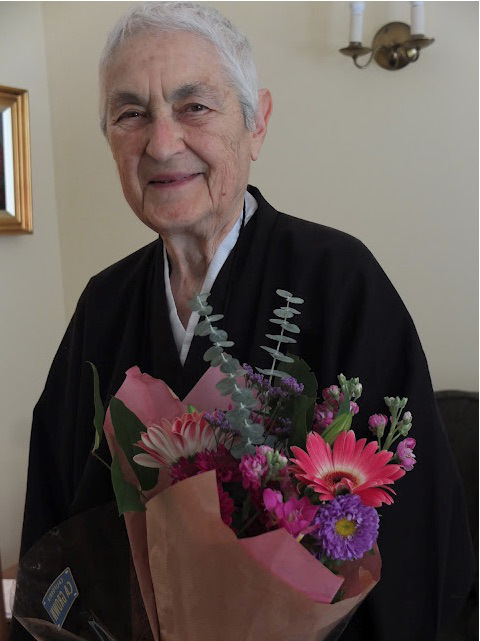 Zen Center’s leadership both in the temple and in administration has been closely involved with the Hartman family in making decisions to ensure that Blanche is safe and cared for in a way that honors how she has shared so much of herself with so many. Blanche’s family is now making plans to move Blanche to another assisted living facility in San Francisco where she can have a private room. We’ll let you know when that happens on this blog. If you have any questions or concerns about Blanche or her current care, please contact Danielle Macias at 415.354.0378 or retirement@sfzc.org. Hi, I fondly remember her husband who passed away relatively recently. Can you remember for me his first name? Lou Hartman, Blanche’s husband, passed away in 2011. It is wonderful to receive this news. Also, Blanche is now a published author and her book Seeds for a Boundless Life: Zen Teachings from the Heart (Shambhala Publications) is available. Very happy to report that the Austin Zen Center (Texas) is having a special Ice Cream Social and Book Party this coming Saturday night! We will be “launching” Dear Blanche’s book with a box full to sell. Wish we could bring over a nice ice cream sundae to Blanche!